"Penguins of the Falkland Islands & South America"
Despite the specific name of patagonicus, King penguins no longer breed in Patagonia, or indeed any other part of South America. They used to breed on Islas de los Estados (Staten Island) until the colony was wiped out by sealers during the 19th Century. 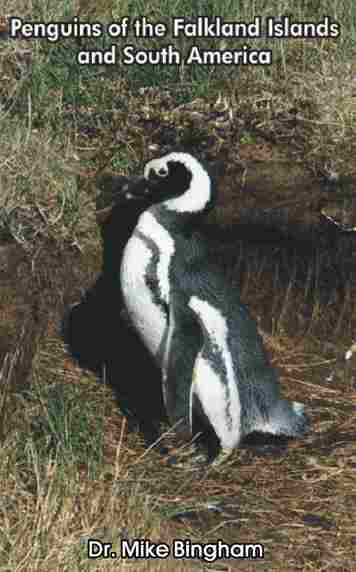 There is a breeding population of about 400 pairs on the Falkland Islands, but the main breeding colonies are found on the islands of South Georgia, Crozet, Prince Edward, Kerguelen, Macquarie and Heard, which all lie close to the Antarctic Convergence. 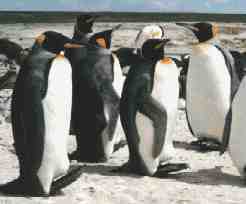 The King penguin is the world's second largest penguin, with a typical weight of 12 - 14kg, and an average length of 90cm. Length is measured from the tip of the bill to the tip of the tail, in an outstretched bird. This is a more reliable measurement than height, since it is not affected by variations in stance. King penguins have distinctive orange patches on either side of the head, which extend down and meet beneath the chin, where they become yellow and fade into the silvery-white breast plumage. The mandibular plates on either side of the bill are also orange in colour. The female is slightly smaller than the male, but has similar plumage. Preferred breeding sites are flat coastal plains within easy reach of the ocean via a sandy beach. The breeding cycle is different to that of other penguins, with chicks taking the better part of a year to fledge, and a full breeding cycle lasting more than a year. This leads to pairs becoming out of phase with their neighbours, so that eggs and large chicks can be seen in the colony together, and pairs generally breed twice every three years. Chicks over-winter in the breeding colony, and during this period the chicks remain in creches, and are well insulated from the cold by their long brown downy coats. King penguins make no nest, and instead lay a single egg of around 310g, which they hold on their feet for the entire incubation period of about 55 days. This adaptation allows breeding in much colder terrain than would be the case for species that lay their eggs on the ground, and negates the need for nesting material. The eggs are brooded by both parents in turn, with shift changes of 6 to 18 days; the non-brooding parent going to sea on extended foraging trips. The newly hatched chicks are also held on the parents feet for the first 30 - 40 days, by which time they have developed their mesoptile plumage, and are able to regulate their own body temperature. During chick-rearing, parents continue to take turns at brooding, but change over periods vary from 3 - 14 days, so chicks may have fairly prolonged waits between feeds. Chicks are eventually left in creches, to allow both adults go to sea on prolonged foraging trips, with chicks being fed even less frequently. By mid-winter, chicks are still dependent on the adults, and often undergo periods of up to 3 months between feeds. Healthy chicks have been shown to be able to survive up to about 5 months without being fed. It is quite common for chicks to lose 50% of their body weight whilst waiting for food. Despite this lack of food, King penguin chicks are able to survive prolonged periods of extremely cold weather. This is achieved by increasing metabolic activity through the burning of body fat in muscle tissue, despite remaining inactive. Stored body fat reserves are usually adequate to maintain the chicks for at least 3 months, but as body fat reserves become depleted, chicks must begin to break down body protein to provide energy. Weight loss then becomes more rapid, and starvation would eventually result unless the chick was fed. Chicks eventually fledge the following summer, and will not return to breed until they are at least 3 years of age. King penguins can live to over 30 years of age in captivity, and in the wild they normally return to the same site to breed throughout their life. Breeding is preceded by the period of moult, which lasts 4 to 5 weeks. Their return to the breeding colony is poorly synchronised, and hence birds often change partners each breeding cycle. King penguins generally forage at depths of 150 - 300m, with 500m being the maximum depth recorded for this species. They mainly feed on small bioluminous Lanternfish, although they will take other prey, such as squid. Deep dives are only made during the daytime, but King penguins can also feed at night by making shallow dives. Presumably they can still hunt by sight at night because of the bioluminous light emitted from their prey. Since light penetration does not appear to be the only factor determining foraging depth, it could be that foraging depth is largely determined by diurnal migration of prey species in response to day and night. Human impact is currently very low, despite King penguins being a great tourist attraction in the Falklands. They are very tolerant of human presence, and are not alarmed by the presence of tourists, provided that they remain at the outskirts of the colony. There is no direct exploitation of King penguins, and they are seldom caught as a result of commercial fishing, other than through the occasional discarded net. There is very little overlap between the prey of King penguins, and commercially harvested species of squid and fish. Fishing industries are therefore unlikely to greatly influence King penguin population trends. With an estimated population of nearly 2 million pairs, there are no particular concerns for this species at present.